Cold, windy and cart path only for round one. Finished +2. Better weather but +4 was the best we could do today. With the Q-School finals around the corner and two poor performances in a row, a change was in order. Yu will be taking her dad for the finals. He worked 2nd stage, knows her game and is her prime motivator I was told. So now I’m looking once more. So goes the life of a caddie. 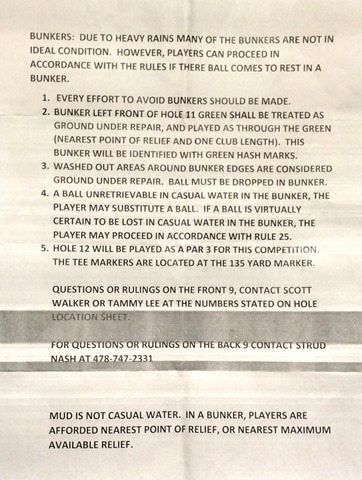 Given the damage done by Saturday’s rain, a few extra measures were taken regarding the bunkers to speed play. I love the first one. Isn’t that part of Golf 101? This entry was posted on Tuesday, November 24th, 2015 at 2:55 pm and is filed under Uncategorized. You can follow any responses to this entry through the RSS 2.0 feed. You can leave a response, or trackback from your own site.